Among the collection of Rolex dress watches, the Day-Date is without a doubt the most luxurious. And for understated luxury, the white gold Rolex President is a solid choice. Famously known as the Rolex “President”, the Day-Date is available in three shades of gold or platinum. When the Day-Date made its debut in 1956, it sported a 36mm Oyster case. Today, because there are different sizes available, Rolex has labeled the collections as Day-Date 36 and Day-Date 40. More elegant than flashy, let’s take a closer look at the chic white gold Rolex President ref. 118239. The white gold Rolex President ref. 118239 is part of the brand’s current collection. Its 18k white gold 36mm Oyster case is joined by a matching 18k white gold bracelet. With the ref. 118239, wearers can actually choose between the dressier and curvier President bracelet or the sportier and flatter Oyster bracelet. Unsurprisingly, Rolex produces its own gold at an in-house foundry to ensure a quality that can meet their exceptionally high standards. White Gold President with a blue dial. As with all of their dress watch collections, Rolex presents a slew of dial choices on the Day-Date 36. From bright colors with baton indexes to mother-of-pearl with diamond hour-markers to classic white with Roman numerals, the options are many. A classic blue dial looks particularly good against the cool metal of the white gold Rolex President. The variety within the Day-Date 36 collections makes it easy to find a perfect watch for their wrist. The most distinguishing feature of the President, as its name suggests, is the day and date windows on the dial. In fact, the inaugural Day-Date from the 1950s was the world’s first wristwatch to display the day of the week written out in full, along with the date of the month. Today, in addition to English, the day of the week is available in a range of languages including French, Spanish, German, and many others. A white gold President with diamonds as the hour markers. 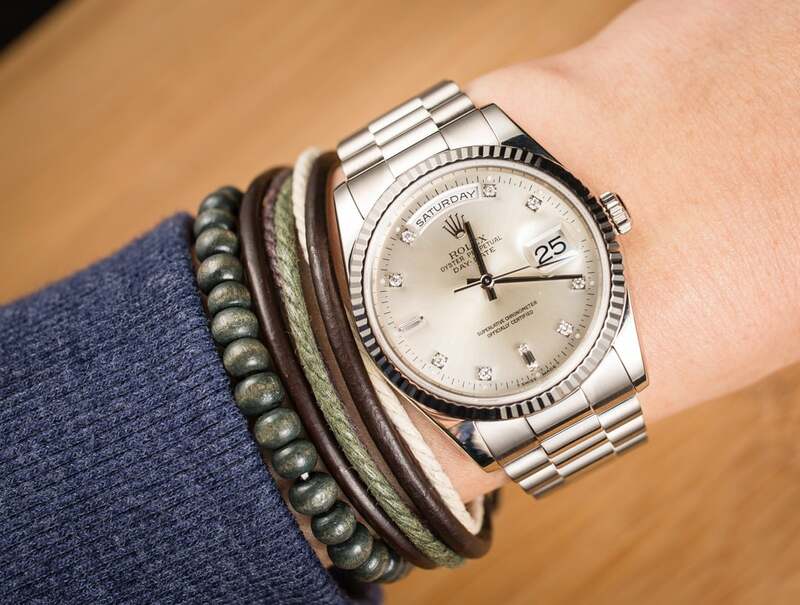 Powering the Day-Date 36 is the Rolex Caliber 3155 with 48 hours of power reserve. Similar to all modern Rolex calibers, this automatic caliber is a manufacture movement built entirely in-house. 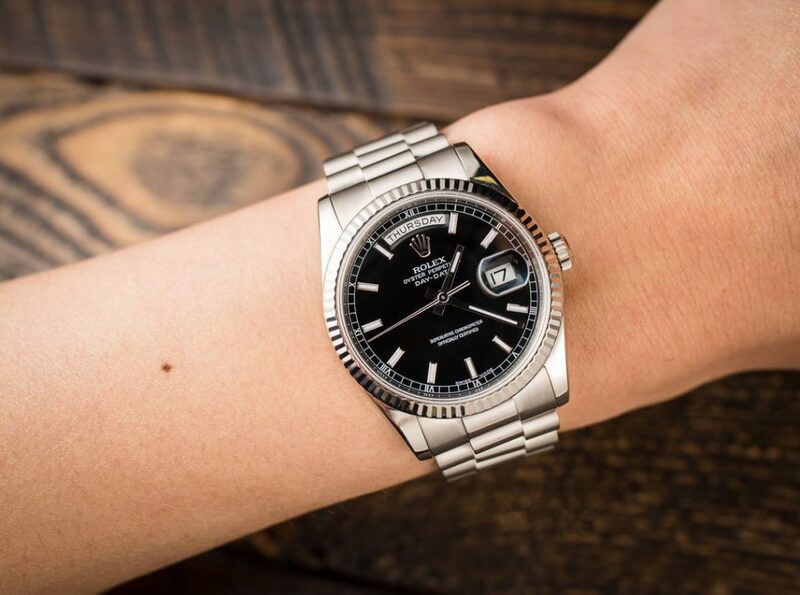 Not only is the caliber COSC-certified, but it has also undergone a battery of tests conducted by Rolex, thus earning its “Superlative Chronometer Officially Certified” label. What’s more, due to the construction of the Oyster case, fluted caseback, and screw-down winding crown, it’s water resistant to 330 feet (100 meters). 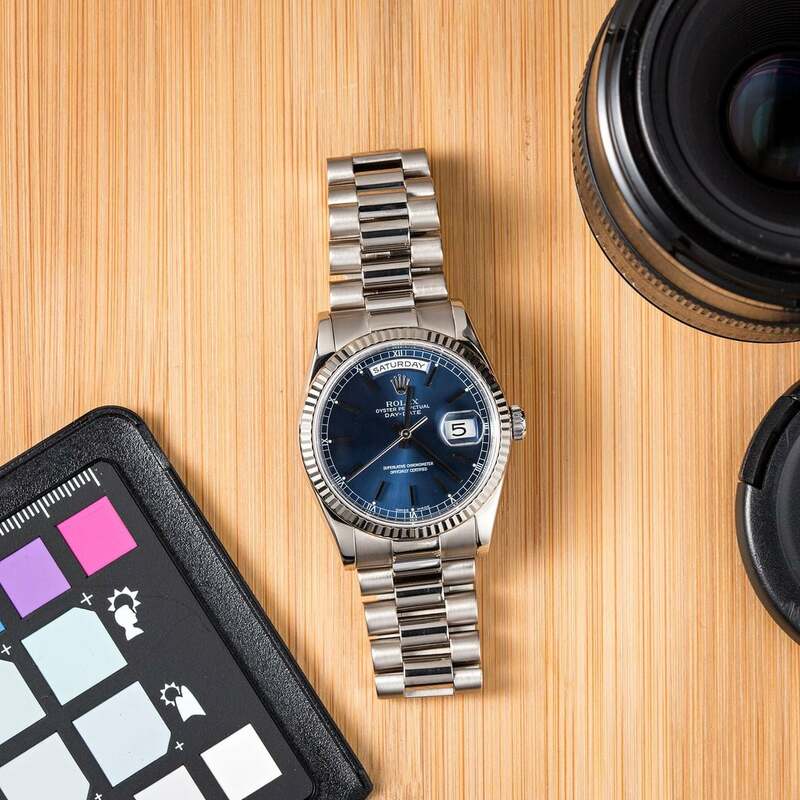 In 2015, Rolex equipped their new Day-Date 40 collection with a new generation movement that boasted a -2/+2 accuracy rate—well beyond the -4/+6 seconds per day maximum allowed by COSC. Since then, the brand has rolled out the new -2/+2 accuracy rate across all their new watches. Yet another example of Rolex’s incredible self-imposed standards. Given its iconic style, rich heritage, and renown status, the Day-Day will forever reign in the luxury watch space. And the white gold Rolex President is an exceptionally superb version. What are your thoughts on the white gold Rolex Day-Date? Leave us your comments below.